Outsourcing Manufacturing - Want To Outsource Manufacturing? Don’t Risk These Four Things! Want To Outsource Manufacturing? Don’t Risk These Four Things! The benefits of outsourcing manufacturing heavily outweigh the disadvantages. So why doesn’t every business do it immediately? Fear, cost, quality, and transition issues all cloud the horizon for those looking to outsource internationally. But it doesn’t have to stop your business growth in its tracks. As long as you have brand, production, and quality standards, the world will open up to you and help you grow. All it takes is one phone call to Unite Global Sourcing. At UGS, we take significant risk away from outsourcing. Our vetted lists and longstanding professional relationships with manufacturing and fabrication factroers all over the make us the premiere sourcing company to do business with. When you choose us, you get more than a connection to a manufacturer. We provide 24-hour communication processes that ensure your product, component, or otherwise is taken care of from start to finish. And it all starts with your expectations as a business owner in a global market. In this post, we share the top four risk factors you must mitigate when outsourcing to actually be able to take advantage of it. Thankfully, UGS does this for you, so you can keep working on your business instead of in it. It can be tough to trust someone halfway around the world to take care of your manufacturing, fabrication, or fulfillment needs, but that’s why it’s such a great business move—if you can pull it off. You must do your due diligence in investigating the supplier from all angles, including operations, labor, quality, leadership, and more. You want to spend the time to ensure that the supplier is everything they promise to be and more. Nothing is more satisfying than discovering you’ve made a poor business decision, and it’s someone else’s lack of follow-through that’s causing the disruption in your operations. 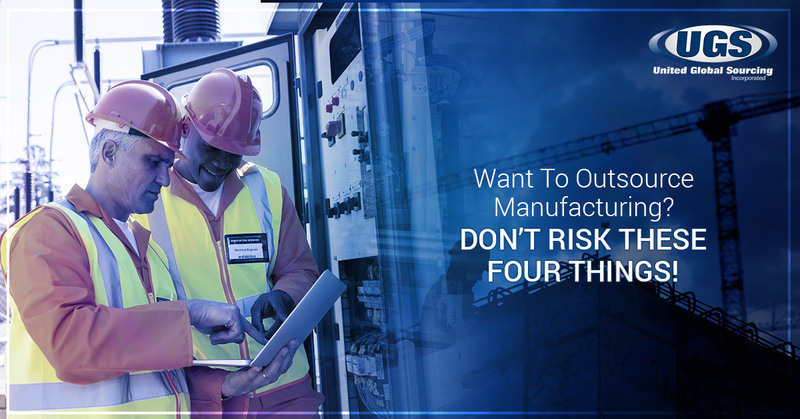 You can mitigate this risk yourself by communicating multiple times, visiting the factory, and attempting to contact others who’ve used or are using the current factory you’re interested in hiring. Yes, you can save money outsourcing manufacturing and fabrication, but can you deliver the same quality compared to keeping everything in-house? As mentioned in the first risk, you need to do your due diligence. Not only can a decrease in quality ruin a brand, but it can disrupt operations, taking months to resolve. This is a real risk that you need to mitigate, if not remove entirely, from your business standards. When you decide to investigate, you can spend a few days to a few weeks observing the manufacturing process to ensure quality. This is much less expensive than discovering an entire production haul must be recalled due to quality assurance issues. It’s true that information can be leaked, especially in countries around the world that have less stringent IP laws. However, you can mitigate when you research reputation, clients the potential outsourcing company has worked with, and other professionals who vouch for them. It’s all about minimizing risk and maximize benefits when it comes down to it. Transportation/Delivery – The time from order to delivery needs to be consistent. Does your outsource supplier keep within this timeframe or does it increase? Know this so you can work on adjusting customer expectations or find a way to get times back in the proper expectation window. Cultural Differences – Between countries, cultural differences can have an impact on brand identity. Some of the biggest brands in the world understand this, and they thrive no matter which country they enter into. Make sure your brand adjusts to the culture and heeds tradition, expectation, and standards while integrating. Sourcing Labor – It’s a rare conversation, but when it surfaces, where you outsource your work can be detrimental to brand. You need to make sure who you hire to manufacture, fabricate, or fulfill your products is up to humane standards and follows closely, if not exactly, the guidelines of your home country for labor laws and the like. Weather – This can be a factor in all of the above when it comes to reputation. The weather can delay orders, put your brand in a negative light due to how you handle certain situations or reveal the labor force you’re using isn’t as great as you thought. It can be tough in this global world to find a sourcing strategy that fits your vision. You could spend months looking for a factory to outsource manufacturing, only to find out the perfect factory doubles your turnaround times. At United Global Sourcing, we offer sourcing strategies and connections to manufacturers all over the world so you don’t have to do the research alone. Our sources are fully vetted and meet our top-tier standards in production and labor. Stop wasting your time doing it on your own. Contact United Global Sourcing today!